While looking for a replacement for my Lowepro SlingShot. I was unable to find something that I liked and would work for me in their selection. My local camera store recommended the Crumpler Messenger Boy 8000, after a long search I finally found a place where I could order it. I found the color selection to be a bit lacking. However the brown with green one isn’t too bad. I can fit my Canon 7D and 2 lenses in there, I can also store some miscellaneous things like lenspens, microfiber cloth, a spare battery, my cellphone and ID which is what I was after. If need be I can store my BlackRapid RS-Sport in one of the lens slots. Above is my bag layout, it has a few components that can be positioned however you like it, I found the above to work best for my setup. The camera on the right side; underneath it I store things like my remote, spare battery,… This way I can easily slide in the hand-strap and take out the camera when the bag is located on my left side. (I’m right handed) On the left of the camera I can store 2 lenses, I only have one in there and carry my sunglasses and some extra bits in the 2nd slot. 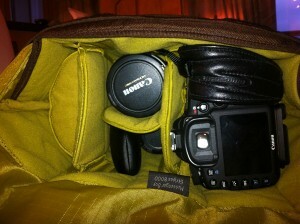 Due to my camera having some attachments, I gave it a bit more room so it slides in and out comfortably. The result is that the pocket on the left is rather small, the separator can actually be extended a bit further but this works fine to cover up my cellphone and ID cards, it leaves a bit of space to put small things like lip balm and such. 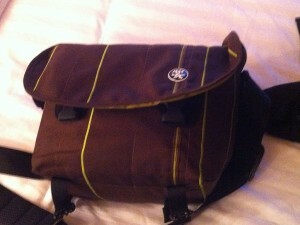 The bag is a bit to thick for my preference, I would have prefered a thinner but longer model. 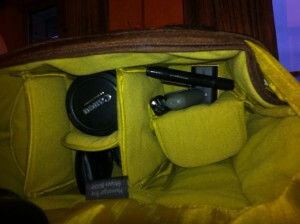 It also lacks an all-weather cover like my Lowepro bags have. But it’s the only bag I found that would work for me. Overall it is a good bag, not great but good enough. I’m only hesitant to take it out in heavyish rain fall.